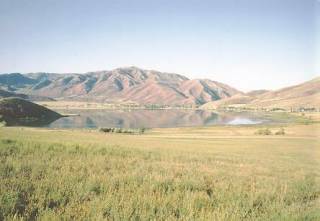 Mantua Reservoir is located between Brigham City and Logan in Northern Utah. It is a popular lake for bass fishing as well as for bluegill. It now has an abundant population of Yellow Perch as well. Mantua is a 500-acre reservoir located 15 miles east of Brigham City. This is a place where you can catch fish easily, whether you're in a boat or on shore. Onsite restrooms and a boat ramp make it a convenient recreation spot, and shoreline access around the entire reservoir draws many float-tubing anglers. Mantua has two fishing opportunities that are hard to beat. The bluegill in Mantua are very plentiful and can grow to record-breaking sizes. The current Utah state record bluegill was caught in Mantua (2 pounds 7 ounces). In the spring, bluegill are very catchable on flies, jigs and poppers. Just wait for the water temperature to reach 60 degrees in May or June and go have a blast. The other opportunity you shouldn't miss is Mantua's topwater largemouth bass fishing. It's second to none throughout the spring, summer and fall. Throw any topwater bass bait along the shoreline and just hang on to your pole. In the winter, the yellow perch and rainbow trout also make Mantua a great place to fish through the ice.